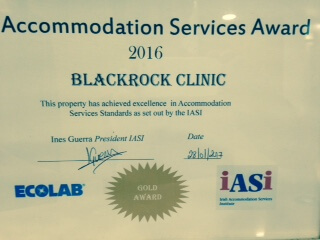 Blackrock Clinic has achieved a Gold Standard in the Irish Accommodation Services Institute (IASI) awards, the presentation of which took place on Saturday 29th January at the Clayton Whites Hotel, Wexford. This is an annual award ceremony held by IASI, the national body representing the professional interests of the accommodation industry in Ireland. The award was accepted on behalf of Blackrock Clinic by Mr. Michael Mc Gowan, Head of Facilities, whilst the accommodation team of Derrycourt Cleaning Specialists attended to accept their own accolade. Blackrock Clinic was nominated after a rigorous auditing trail by the IASI judging panel, and is delighted with the gold standard awarded. Derrycourt has worked alongside Blackrock Clinic since the beginning of 2016 and both parties have a collaborative focus on patient safety, comfort and infection prevention. The partnership is thoroughly committed to absolute cleanliness and hygiene in all areas of the hospital campus. This annual award is a deserved recognition of the dedication of all involved in maintaining these standards, both front of house and those behind the scenes.